IBM has been sending strong messages about their future business goals in Asia Pacific, to the analyst community and the larger market as a whole. Over the last 2 analyst briefings held in Melbourne (August 2018) and Singapore (November 2018), they have emphasised their focus on the ‘Hero Brands’, the multicloud, their Open-First policy, and their One IBM messaging. Consolidating their Portfolio into ‘Hero Brands’. IBM’s portfolio has been consolidated into IBM Services, IBM Watson, IBM Cloud, IBM Security, IBM Systems and IBM Research. This consolidation represents a holistic and cross-cutting approach to the market and is likely to give IBM an edge in implementing emerging technology solutions. As an example, the Technology Support Services (under IBM Services), leverages both Watson-enabled support and Blockchain-based billing and invoicing. Ecosystm Comment. IBM Watson still remains a flagship brand for the organisation and should be integrated more within the stories of the other ‘Hero Brands’. While the penetration of Watson capabilities has grown, it is not what it should be, considering that IBM has first-mover advantage in the cognitive/AI market. IBM needs to actively play to their strengths and build further capabilities leveraging the Watson/ IoT/ Blockchain ecosystems. Focusing on the Multicloud. IBM’s strong experience in cloud deployment, migration and management gives them a true understanding of the cloud adoption landscape. They are pushing the concept of the multicloud, leveraging their capabilities to manage other vendors’ clouds, acknowledging the reality that organisations are at disparate stages when it comes to cloud adoption, and that they all have their own unique journeys. While the public cloud with cloud native workloads, is the end-game, IBM understands that their clients run their workloads across public, private and hybrid clouds, and have developed a capability to support all of these environments. Ecosystm Comment. For many of IBM’s traditional clients, this is the right approach to take – these are companies with typically highly complex environments where simple messages around “take it all to the public cloud” might be more easily said than done. IBM will work with these clients to help them modernise their business and make the most of their current on-premise and hosted applications. Moreover, data localisation requirements in some countries will also require a hybrid approach to the management of cloud assets. While the market implications of IBM’s Red Hat acquisition are being discussed at length, other initiatives such as strengthening their automation capabilities, extending their relationship with ServiceNow, and their Open-First policy will also benefit IBM and the market as a whole. Creating a Services Differentiation. The Managed Applications division under Global Technology Services (GTS) – that works closely with Global Business Services (GBS) acknowledges that managing SAP and Oracle applications on IBM Cloud is their fastest growing market. So, given the plethora of service providers, especially in the region, how do they create a differentiation? IBM’s response is to infuse ERP deployments with change management capabilities to help companies become truly digital. This is bolstered by their Industry Impact Solutions, and the One IBM messaging. GTS and GBS coming together to deliver an end-to-end solution, can potentially give their clients a better understanding of the technological requirements, change management, and TCO. Ecosystm Comment. 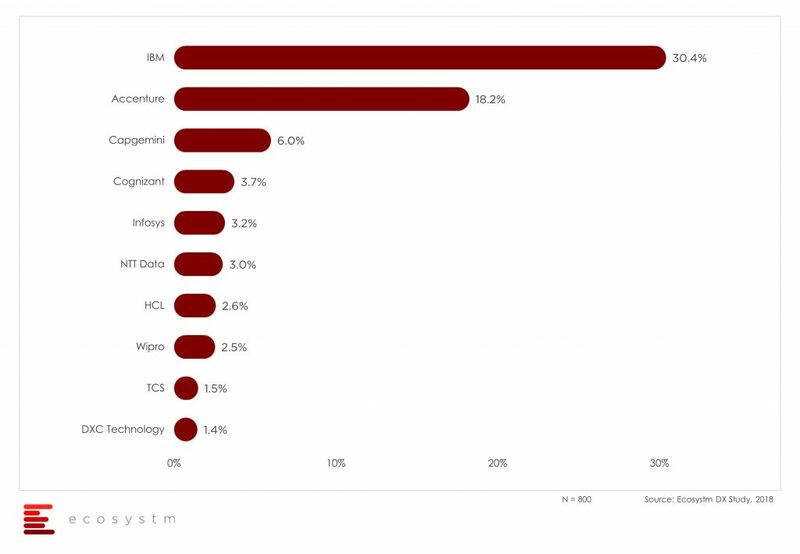 In the studies conducted by Ecosystm, IBM features as the vendor with the highest mindshare for IoT and Mobility and comes in at 2nd spot for AI. However, where they clearly lead the market is in being the services provider of choice when it comes to Digital Transformation (DX). As organisations make the transition to digital operating models, services providers that can provide scale and skill, will become significant partners in the journey. IBM indisputably has both scale and skill, and the One IBM messaging can further strengthen their market position as the service provider of choice for DX. However, this messaging should be far more consistent and run across IBM’s entire operations for better market positioning. Improving their Customer Capabilities. Over the past few years IBM has invested in its delivery capabilities, with design thinking, ideation sessions and customer journey mapping, included in many of their client engagements. They have brought in experts from outside of IBM to provide many of these capabilities – uncharacteristically, many of the IBMers you meet who offer or drive these services are new to the organisation. They are also driving new technology processes and capabilities within many of their clients – moving beyond simple systems integration to helping their clients change their internal digital delivery processes. Ecosystm Comment. In an era where change is constant, the ability to drive change within the business will be central to the ability to succeed in the market. Too many companies bring in external consultants and SIs and instead of leading the change, they let the SI lead the change. They do not take many – or any – learnings out of the engagement and are completely reliant on external consultants every time they need a big change. While this is a great opportunity for the SI and consultancy providers, many companies – IBM included – want their clients to succeed. So instead of selling them lemonade, more and more they are teaching them to make their own lemonade.